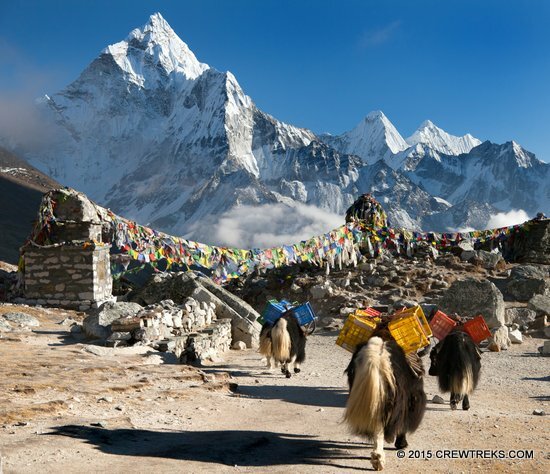 Short on time, but still want to do Everest Base Camp Trek? NO PROBLEM! For this operation we will use Ecureuil AS 350 B3e helicopter. Loved by everyone Domi Sherpa and Ongchhu Sherpa will be guiding on this breath-taking trek to the heart of Himalaya. Along the way, we’ll visit Sherpa villages, hike peaks with stellar vistas, and get up close and personal with Himalaya’s Giants: Lhotse, Cho-Oyu, Makalu and Everest! Price: Due to Helicopter Rates, we must have a minimum of 4 passengers for this program. Please inquire with Crew Treks for rates with lower passengers ratio. Day 08 (Apr 08 2018/2019) - Trek to Dingboche [4410m] 5hrs We are at high altitude already, easy does it! Day 09 (Apr 09 2018/2019) – Rest day for Trekkers to acclimatise, or climb a peak if you are up for it! Day 10 (Apr 10 2018/2019)- Trek through Lobuche Pass to small settlement of Lobuche. Day 12 (Apr 12 2018/2019) – Summit Kalapatthar [18,500ft] and trek back to Dingboche [4410m] hard day mostly downhill! Day 13 (Apr 13 2018/2019) – Early in the morning board helicopter to Lukla and transfer to a regularily scheduled flight to Kathmandu. Sleep at guest houses/lodges along the trail. Eat breakfast and hike 4-6 hours on an average day. Since we will be staying at lodges, backpacks should be light! We will use porters to lighten the loads. Daytime temperatures should be in the 50’s and sunny, but nights can get cold! As we move higher, temperatures will drop! Please have two passport pictures and change readily available! If you are just transiting, you do not need Indian Visa - you can stay at in transit area at New Delhi International Airport. Sleeping Bag (rated to 0 degrees f. / Synthetic or down) To save space, please use compression stuff sack.